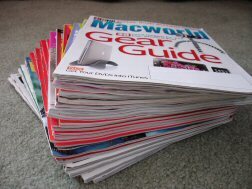 Are you looking for some help to organize magazines? Do you have stacks of magazines, some old, some new and unread? Do you need help letting go of old magazines or help learning to cut back so that you can actually keep up with all the reading material pouring into your home? Magazines are great reading. There are magazines on every subject you can imagine. As well, many of them are quite affordable and there are always deals to get a year’s subscription for free to prevent your airline miles from expiring! Too many magazine subscriptions, though puts a burden on yourself. I love reading magazines when I have a short few minutes here and there to read the short articles. But if I have a backlog of magazines and new issues are arriving, or if I have several weeks or months of a single magazine to read, I feel stressed and behind. This is not a school assignment. No one told you that you MUST reach every issue and every article from these magazines, cover-to-cover! If you can’t keep current with the issues of your magazines, you probably have too many. Or, if you need to read them constantly, neglecting other tasks or people to keep up, you may be subscribed to too many magazines! A good rule of thumb is to limit yourself to three subscriptions. That’s three magazines a month to read, or more if any of your subscriptions are weekly. Remember, you do have a life outside of reading magazines! If you have too many subscriptions and they aren’t going to run out any time soon, you may be able to cancel them or transfer them to someone else. Call the magazine company to see. This includes ones you’ve read but haven’t tossed yet and ones you haven’t read yet. Yes, toss magazines that you haven’t read. Set yourself a rule that you can only keep the two most current issues of a monthly magazine. If you have any older than that which you haven’t read, you may never get to them. And if you do, the material will most likely be outdated. It’s hard to throw perfectly good unused items away, but try to think about how it will help your home be less cluttered, and your mind less stressed. And, if you hate wasting magazines, this is a definite sign that you need to cut back on the subscriptions! You can recycle old magazines or you may find that the library or a doctor’s office or hospital may take them off your hands. Especially if they’re not very old. Don’t you just hate going into an office and picking up a magazine from seven years ago?! Keep your unread magazines in a single spot so you can see what needs to be read. A simple magazine rack is perfect. Also, if you have a small magazine rack it can help you to regulate how many you keep. If it starts to get full, it’s time to purge some older issues. Here are a couple ideas to organize magazines to be read. Put a small magazine rack near a reading chair. Use a wine rack and roll each magazine and insert where the bottle would go. To organize magazines that you've already read, get some magazine storage containers so they can be stored standing up and you can easily see what magazines you have on hand. Keep issues of the same magazine together and keep them in order by date. Sometimes you don’t really need to keep an entire magazine. Think about it, a good portion of most magazines are advertisements. If there is a particular article or idea you want to keep for future reference, go ahead and rip that out of the magazine and keep it. It will certainly take up a lot less space just keeping the three pages from the magazine instead of the entire magazine. Store those pages in a hanging file folder, accordian file folder or a three ring binder with plastic pages. But you need to remember to keep limits on these too or eventually you’ll have an entire file cabinet or a stack of binders filled with articles you’ve ripped out. Put recipes you want to try with your cook books in the “to try” section. Research items of interest and toss the pages. Exercises can all go into one folder for you to try out. I have to tell you though, I rip out pages all the time and file them, and 99% of the time, I forget about them. So use them, or get rid of them, don’t store them indefinitely. TIP: If you're heading out to an appointment and know you're likely to have some time to kill, bring one of your magazines along and catch up on your reading! Or bring your own magazines when flying instead of buying new ones in the airport. I hope this brings some peace into your life in regards to magazines. And remember, you can’t organize other people’s things, including their magazines. You can only be a good example for them. I know first hand.